Are you looking to take your dog on vacation with you or the family during spring break? It is time to let your hair down and enjoy the sun with your family in a special way. Everyday life can be stressful and overwhelming and your pets need a break too. Petland would like to share four easy tips to keep your pets comfortable, happy, and safe while traveling to your much-needed destination. Need a perfect companion to take on future spring breaks, check out our available puppies right here! Create a checklist of the things you need for your trip. We believe having a checklist keeps things on track and increases organization. Take an inventory of all the items and supplies your pet needs to be comfortable before packing. Make a checklist you can use for packing your pet’s luggage not just for this trip, but trips in the future as well. The more organized you are the less stressed you will be. We have several Petland locations near you if you have questions about taking your pets on vacation. Make sure their health is up-to-date. Is your pet up-to-date on their vaccinations? Make updating their vaccinations a priority before traveling. 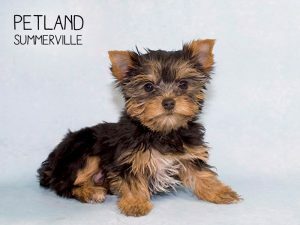 Petland in SC wants to make sure not only you have a wonderful vacation, but your pet does too! Keep your pup healthy and happy by making sure they have everything they need before traveling. Keep your dog safe in the sun. If you’re traveling to a warmer climate, you want to think about how to keep your dog protected from the sun. Dogs can become dehydrated if they don’t get enough water while in the heat. Be sure to have water available while touring. Be sure to take breaks if needed if you’re walking your pet during extreme temperatures. It is not a bad idea to walk during the evening time when it is much cooler and tolerable for your pet. Remember you can always count on us. We have Petland locations near you and can assist to keep your pet safe while traveling. Keep your dog safe while swimming. Most people travel to warmer climates for vacation during spring break to experience some fun in the sun. As a pet owner, you may want to take a dip in a pool or visit a beach with your pup. Be sure your dog is prepared to swim in the pool should you make this a goal during your vacation. Depending on the breed, your pet may not be able to swim without the proper swim gear. Be sure to check with your veterinarian or visit us at Petland locations near you for advice on equipment and or questions about how your pet can enjoy the beach or pool comfortably. Spring is here and it is time to hit the road! There are so many different ways to travel and people are becoming more creative on checking items off their bucket list. Traveling by recreational vehicle or van has become very popular in recent years. If you are looking to travel this year with your dog in an RV, we at Petland in SC would love to help you with your dreams. Read on for four must do’s while traveling in an RV. Traveling in an RV sounds adventurous and easy, but it can get tricky with having a limited amount of space. You can’t take everything with you while you’re traveling, so you want to think about the most important essentials necessary for your dog. That means instead of bringing the entire toy selection you should think about bringing only the top two toys for your pet. While you’re on the road, your style for travel may vary. You may stay in a campground or use parking lots to camp out during the night. If you’re traveling to a colder climate, research how to keep your dog warm in the winter. Whatever the choice, always make sure it is accommodating for your furry friend. For example, you don’t want to visit a campground that has a “no pet allowed” policy on the premises. Depending on how long you will be on the road, you’ll want to make sure you maintain a schedule for your pup. Your schedule doesn’t have to be rigid, but your pet should know what to expect at least in the morning and evening. Be consistent with their feeding and walking times. 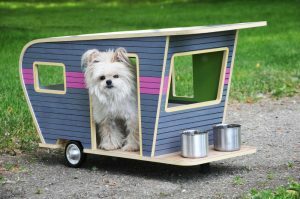 This should help your pet adjust well to the temporary mobile home and decrease any anxiety they may have to the new change. Make sure your dog has their immunizations before hitting the road. It also may be a good idea to have your pet groomed as well, especially because you will be away from home for an extended amount of time. This may include getting your dog’s hair cut and nails trimmed. If you’re concerned with how to keep your dog warm in the winter – come visit us a Petland in SC today. Whatever your style of travel may be, Petland in SC wants you to be equipped and prepared for your trip. We make every effort for pet owners to be the best caregivers they can be. For more information, visit a store near you! Spring is here and it is all about being outdoors and making memories with your family and furry friends! Get some more use out of your backyard by turning it into a field day for your dog. We at Petland, believe it is important for your dogs to have activity during the day to maintain good health. Read on for four fun ways to turn your backyard into games for your pet. See what you can find around the house to create a maze for your pet. Use items, such as rope, or sticks to create a maze or track for your pet to follow. No matter if you have Frenchie pups or your dog is from the cutest big dog breeds they will be able to participate in the maze game. In the end, be sure to have a prize waiting as their incentive. 2. Fetch a toy in the pool. Your dog will be so happy with this game. It will keep them cool and busy. Simply buy a kiddie pool and throw in their favorite chew toys for them to fetch. Some dog breeds may have difficulty swimming, such as the Frenchie pups so you should avoid overfilling the pool to make it comfortable and fun. 3. Jump in the pile. 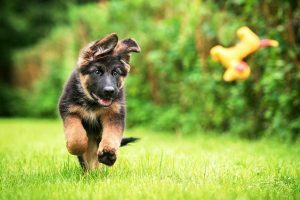 You can get as creative as you like with this game, it is mainly to increase your dog’s activity in a short amount of time. 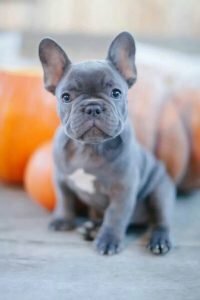 This again can be for the cutest big dog breeds down to Frenchie pups – it doesn’t matter the size. You can make a pile of leaves, or dirt, etc. for your dog to jump in to dig for their prize. The important thing to do here is to make sure they see you burying the toy before you let them have at it. Be sure whatever pile you make is soft enough for your dog to jump in without getting hurt. Lastly, this game is just a simple game for you and your pet to enjoy. Don’t let your pup see you and try to hide from them. Call their name and see if they can find you. Most likely they will because you will be in the backyard. This is just a fun way to get some exercise while spending quality time with your dog. We at Petland, understand how important it is to spend quality time with your furry friends. We love sharing tips on how to improve your relationship with them. We have the cutest big dog breeds if you are interested in owning a pet. Come visit us today or check out our available puppies page, we would love to help! 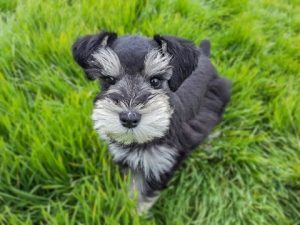 Have you been eying Schnauzer puppies for sale but haven’t pulled the trigger? Perhaps you’ve already purchased one of our Schnauzer puppies for sale and you’re interested in learning more information about them. In any case, we’re glad you’re here. Continue reading to learn these interesting and historical facts about Schnauzers! Sure their thick whiskers are distinct and cool, but they served a purpose beyond being picture perfect. A Schnauzer’s snout, when matted together, actually protected the Schnauzer from being bitten by the vermin they hunted on farms. 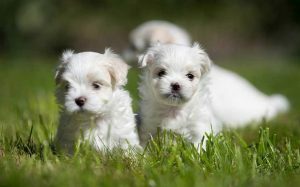 Unlike other breeds like the Poodle, the three sizes of Schnauzer puppies for sale are totally separate breeds. The original size is the Standard Schnauzer, from which the Miniature Schnauzer and the Giant Schnauzer were developed. The word Schnauzer comes from the German word, “schnauze,” which means snout or muzzle. Repeat the word Schnauzer again and you’ll notice that it sounds like “shnaz” which is a slang word for a big nose! They performed many jobs for German families back in the day. Schnauzer puppies were used to guard the livestock, hunt vermin, and protect their owners. The Standard Schnauzer was the ideal size because he was small enough to fit in the farmer’s cart but large enough to serve as a guard dog. Perfect combination! As we just mentioned above, they would protect their owners so it’s no surprise that the German army used them as guard dogs! The first Standard Schnauzer is said to have begun appearing in the United States in the early 1900s. They came with either German immigrant families or with Americans who had gone to Germany and purchased Schnauzer puppies for sale and brought them home. One thing is for sure and it’s that this breed is known for being an amazing pet companion who’s completely devoted to their family members. No matter the size these dogs are excellent with kids and of course, they are awesome watchdogs. At Petland, we always have Schnauzer puppies for sale. 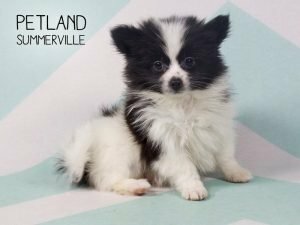 Give us a call today or take a look at our available puppies page by clicking here! Pugs are precious and mischievous! They have the most inquisitive faces. It’s like they’re always asking a question! The Pugs for sale in SC Petland locations are no exception! Our Pug puppies are adorable and people always gravitate towards them when they visit our store. People from all walks of life have fallen head over heels for Pug puppies. They really fit into any lifestyle, whether it’s a single person home or a large family with kids. They make the perfect addition to any household. Here’s a list of our frequently asked questions about Pugs for sale in SC. 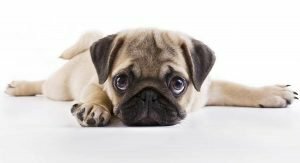 When you find Pugs for sale in SC at one of our Petland locations, you’ll fall in love because of their overall gentle and comical dispositions. They are a happy and healthy breed that’s understandably desired. Take a look at our available Pug puppies page and contact us on how you can own one of our Petland Pugs for sale in SC. Miniature Goldendoodle Puppies – A Whole Bunch of Cuteness in a Small Package! Thanks for joining us on our breed blog of the day, we will be talking about the very popular Miniature Goldendoodle! Now, as you may know, the Miniature Goldendoodle is the smallest version of the Goldendoodle family, but it’s no less loved by people all across America for its sweet and loving personality and small stature. 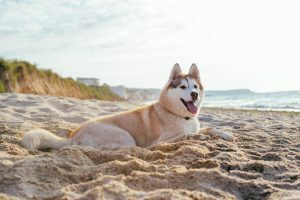 In this blog, we will go over what makes this breed so lovable! Petland always has Miniature Goldendoodle puppies for sale! First off, what is a Goldendoodle? Well, the original Goldendoodle was a hybrid mix between a Golden Retriever and a Standard Poodle. The breed was introduced to the US in the early 1990s, after being bred earlier in parts of Australia. It was then realized that the Goldendoodle cross exhibited “hybrid vigor”. This is a phenomenon in animal breeding referring to the fact that the first cross between two unrelated purebred lines is healthier and grows better than either parent line. The hybrid cross between these two parent breeds are terrific family dogs, friendly, intelligent, affectionate and easy to train. How did the Goldendoodle become a miniature? After the Goldendoodle was introduced, its popularity soared, because it was like having two great breeds of dog in one! The only issue was that the Goldendoodle was a large breed dog and that doesn’t always work for a family. And while the Golden Retriever only came in one size, the Poodle came in three distinct sizes, standard, miniature and toy! With a little help on the breeding side, the Miniature Goldendoodle was born! What are Miniature Goldendoodles like? Goldendoodles are an intelligent and obedient family companion. Miniature Goldendoodles are friendly towards children, other dogs and pets, and easy with strangers. They are social dogs, happiest when with people. Their intelligence, eagerness to please, and love of learning make them very easy to train. They are small to medium sized family dogs with easy dispositions. They can range anywhere from 20-45lbs full grown. What about different generations of Goldendoodles? The first generation crosses, also called an F1, are between a Golden Retriever and a Miniature Poodle. 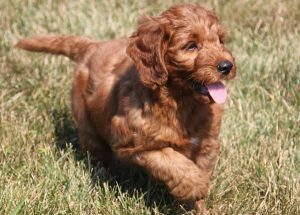 Breeders are also doing an F2 cross, which is between two Miniature Goldendoodle parents and tend to be on the small side. Well, we hope you found this article helpful and if you want to know more about the Goldendoodle breed, check out our breed info page here! Want to find out more about Miniature Goldendoodle puppies for sale in our store? Check out our available puppies page to see Miniature Goldendoodle puppies for sale!